Humans have inhabited the world for over 10,000 years, but a complete understanding of nature has proven to be elusive. In fact, there is much about natural phenomena we still do not know. Ball lightning and will-o’-the-wisp are two such phenomena that science cannot fully explain. In 1809, witnesses on the British ship HMS Warren Hastings reported three flaming balls attacking the crewmen during a storm. One orb set the deck on fire, while another orb struck and killed two other crewmen by burning them. This story, as told by Times Online, can now be explained by ball lightning. 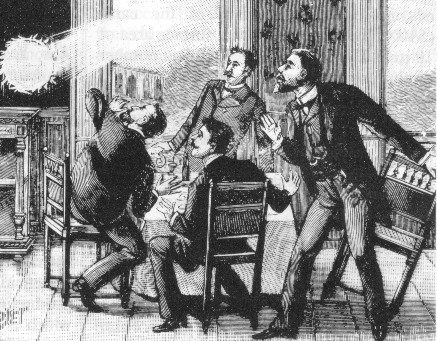 Although more widely accepted to be folklore than science, ball lightning observations have been reported for many centuries. According to howstuffworks.com, even Czar Nicholas II saw such an orb at church as a child. While research has attempted to recreate ball lightning in laboratories, there is no widely accepted or complete theory explaining its existence. Ball lightning is characterized by its round shape, which varies from the size of a golf ball to the size of a beach ball. Its motion is erratic, unpredictable, and seemingly unaffected by wind. Many eyewitness accounts explain that ball lightning can enter and exit rooms through openings or by passing through solid objects. Although it lasts longer than normal lightning, it eventually dissipates, sometimes gradually and sometimes with a loud, explosive popping noise. One possible explanation of ball lightning includes silicon, as reported by New Scientist. During storms, lightning can strike the ground, vaporizing silicon present in soil. This vaporized silicon in the air then condenses as it cools, but because it is charged it forms a ball shape. The glowing of the lightning ball is due to extremely hot silicon reacting with oxygen in the air. This claim has been backed by researchers at the Federal University of Pernambuco in Brazil, who managed to create “luminous orbs the size of ping-pong balls that persisted for up to eight seconds,” according to New Scientist. The high heat of over 3000°F melted plastic. Another explanation is that ball lightning is an aerogel, which has an extremely low density for a solid. The aerogel has a current that passes through it, which forms a ball shape. Another unsurprising explanation for ball lightning is that its appearances are mere hallucinations. In The Lord of the Rings, Gollum leads Frodo through the Dead Marshes, a swamp maze littered with the incorporeal bodies of the dead. Each body holds a candle, which appears as a flame floating over the water. While we do not live in Middle Earth, will-o’-the-wisps are unexpectedly similar to the candles of the dead. They are lights that appear to flicker, seen at night over bodies of water such as swamps and bogs. When they are approached, it is often said they burn out. While not exactly candles of the dead, will-o’-the-wisps can be explained by decaying organic matter. This decay releases the gases methane and phosphine. Both are highly flammable and will ignite under normal atmospheric conditions. This explanation may show how the flame is created, but does not explain why the light fades as the observer approaches, or why the light seems to move along with the observer at times. Another explanation is bioluminescence — for example, barn owls have luminescent feathers — which may explain how the lights seem to move.